Dominion Fertility came to us with the desire to change the way consumers perceived them compared to a larger fertility clinic also in the Washington, D.C. area. With more than 30 years of experience under their belt and outfitted with more treatment choices available than anywhere else, Dominion Fertility was the no-brainer choice — on paper. Their competitor had a reputation of preserving their success rates by turning down hard cases, and Dominion Fertility realized that many of their clients were previous patients of their competitor – or had been turned down all together. How could they revamp their marketing so that users looking for treatment would go to Dominion first? “Get your treatment right the first time,” became the motto that encapsulated our work. It speaks to what Dominion wants to communicate to patients. Dominion Fertility cares more about people than success rates. Their mission is to build relationships with their patients and do everything possible to help them conceive. During our research, we found that the majority of the traffic on Dominion Fertility’s site was on their resource pages, which were informative and useful to people as they were considering fertility treatment options. Glossaries, FAQs, and blog posts addressing specific worries that patients had were excellent resources, but didn’t drive conversions. The solution was simple — implement CTAs and contact forms wherever possible to make signing up easy for the user. 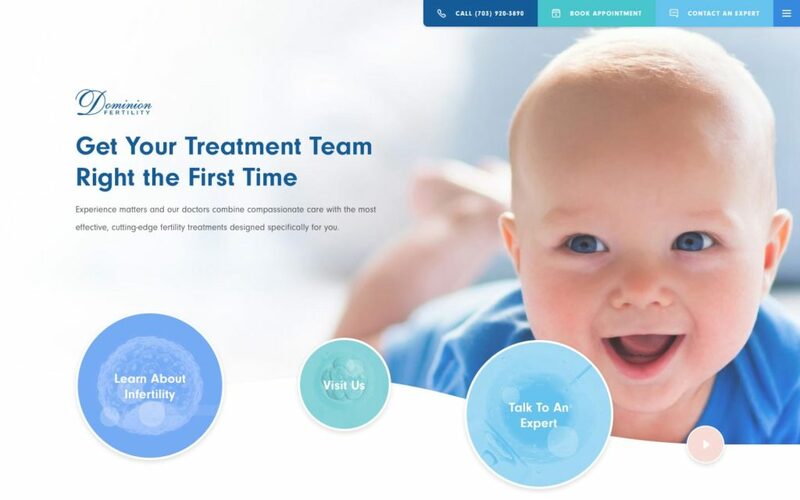 Part of this solution meant revamping the navigation, so no matter what door users entered from, there would be several ways to connect them to success stories, doctors, and communication with Dominion Fertility. Our research revealed that much of the traffic came from users on mobile devices. Part of our solution was to ensure the site was entirely optimized for an on-the-go user, simplifying the navigation and making it easy to contact Dominion. When they came to us, Dominion Fertility wasn’t utilizing email sign ups on their site. So no matter how many users came to look around, Dominion didn’t have any information from them, or way to communicate with them. Another part of our solution was to offer users email sign ups so that Dominion could capture valuable data on site visitors and build a solid database of potential customers interested in fertility treatments.